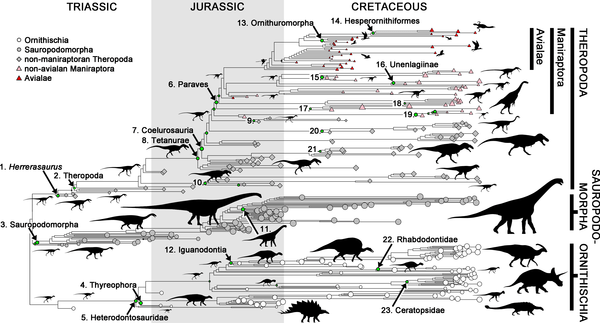 Different rates of body size evolution across dinosaurs (including birds). Benson et al (2014). Importantly, this means that, in terms of body size, birds were constantly and rapidly innovating and changing, which might have set the scene for the origins of the great bird radiation. It’s weird to think about, but with 10,000 living species of bird, we are still technically in the “reign of the dinosaurs,” and it might be due to an early ability to rapidly evolve body size and adapt to changing conditions. Previous studies, including those mentioned above, have had to rely on proxies to estimate body mass. It’s ridiculously unlikely that we’ll ever find a complete dinosaur, and we only have their skeletons to go off. One way of estimating body mass has been to use the circumference of the femur, which correlates strongly with body mass in a range of living organisms – known as an “allometric” relationship. Estimates of body mass in birds have also been applied to pterosaurs, a group of now extinct flying reptiles related to dinosaurs. But the question remains, how accurate are our estimations of body mass in the fossil record? Linear scale association between total body mass and skeletal mass in birds. Logarithmic scale association between total body mass and skeletal mass in birds. Sexual variation between total body mass vs. skeletal mass relationships in birds. Importantly, this scalar relationship between skeletal mass and body mass changes when evolutionary relationships are accounted for. When analysing the evolution of traits such as body mass, a portion of similarity between species will simply be due to the fact that we expect more closely related organisms to adopt similar morphologies. This suggests that when estimating body mass, or using raw body mass estimates to make big macroevolutionary statements, that we should make sure that phylogeny (the evolutionary relationships of organisms) is well accounted for. Source: Does this dinosaur make me look fat?